Terry’s DIY Tube Amp Pages – My name is Terry, electronics have been my hobby for many years. I built my first crystal radio when I was in grade 5, with 1N34A diode and hand wounded coil on a plastic bottle, played with a spider antenna and crystal ear plug, often listened to few stations mixed together. I made my first 6V6 6SN7 5Y3 tube amp in late 1960’s, played with crystal cartridge and self built speaker cabinets. 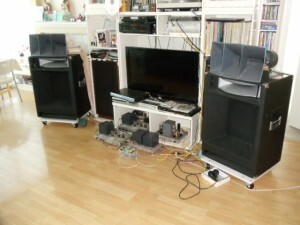 Sound quality was just ok but I enjoyed a lot, later also tried the 6BQ5 and 12AU7 amp. Later on I built AM superheterodyne tube radio with 6BE6 and transistor radio with 2SA52 (first detector or mixer), 2SA49 (I.F. ), 1N34A (2nd detector), 2SB54 (voltage amp) and 2SB56(power amp). Then FM transistor radio, OTL amp (2N3055) and OCL amp (Mj802, Mj4502) in 1970’s. Finally I go with tube amplifiers because of the excellent sound quality. In middle 1970’s, I studied electronics in tube amps, transistor amps, AM FM SSB VHF radios, radio transmitters, electronic switching logics ( TTL, CMOS 8080/Z80 CPUS ) and op amps etc. In 1979 I achieved the Full Technological Certificate Award in Electronics and Radio Telecommunications from City and Guilds of London Institute, which was incorporated in UK from 1878, and this award is widely recognized by the electronic industry. In 1979 I also finished the Electrical Engineering in Hong Kong Polytechnic. In early 1980’s, as a result of rapid development of semi-conductor technology applications and phasing out of the vacuum tubes, the vacuum tube audio application courses had been cancelled and replaced by modern semi-conductor technology courses so that there is no more vacuum tube audio in colleges. From year 2000 vacuum tube amplifiers became popular again. I am a baby boomer, watching the rapid changes in electronic industry for the past few decades. It was a long story to tell. Now I keep continue to explore the world of tube amplifier from the lost horizon. I would like to futher develope tube amplifier experience by projects and experiments.